At the end of the day, Death visits everyone. Right before that, Charlie does. Sometimes he is sent as a courtesy, sometimes as a warning. He never knows which. You might meet him in a hospital, in a warzone, or at the scene of a traffic accident. Then again, you might meet him at the North Pole—he gets everywhere, our Charlie. I've fallen for every one of Claire North's novels. The First Fifteen Lives of Harry August, Touch and The Sudden Appearance of Hope have between them broken my heart and expanded my mind. They've thrilled me and they've chilled me. By way of them I've been exposed to new places, new ideas—new ways of being, even. But if I had to level a single criticism against her thoughtful body of work, it would have to be directed at its measure, because whilst her texts have tackled a great many meaningful themes, not least the array of ways we determine identity, I've found North's literary positions a little non-committal. That's not the case in The End of the Day. This is a book with something to say; something important, if I may. It's slow to start, and oddly episodic even when the plot has picked up; its characters come and go with next to no notice; it's difficult, and confusing, and contradictory—but that's what life is like, right? And the messy, maddening, magical gift of life we've all been given, that's what The End of the Day deals in: not death... although its principal perspective is on her payroll. Charlie, on the other hand, is just a puny human. 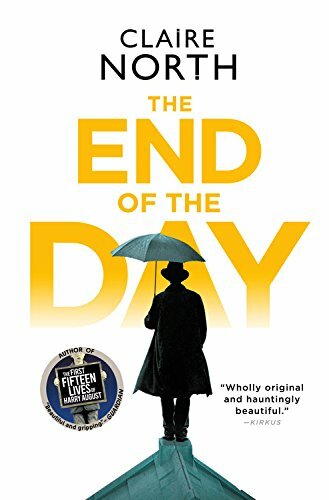 It's characteristically contemplative, yes, and at points disarmingly disjointed, but without giving too much away, The End of the Day is a brilliantly original and abusively amusing book that'll make you angry at humanity at the same time as reminding readers such as we why life is worth living. Equal parts protest novel and speculative testament, it charts a new path for Claire North as a novelist—and though there may be bumps in the road less travelled she's intent on taking, I can't wait to see where it, in turn, takes us.